Our Retro Rhinestone Wedding Garter, a simple but stunning Bridal Piece, is created with the clearest, sparkling, highest quality A1 Czech Rhinestones. Set into a truly impressive and beautiful Retro square design the delicately cut Marquise, Navette and Princess Rhinestones form a beautiful setting. A breathtaking effect, especially when the light hits them!! All our garters are made to your exact leg measurement and will fit you like a glove. They are very comfortable to wear throughout your Wedding Day. Wearing a Wedding Garter on your Wedding Day is such a wonderful photographic opportunity. Make sure your Wedding Photographer includes some beautiful shots for your Wedding Album. Our garters are also perfect for Boudoir Photography – a stunning gift for your Husband to Be. Garters & Co. hand-make their Luxurious Bridal Garters with love and special attention to every detail. All the elements of your bridal garter are made from the finest materials available in Australia. Even the seams have been individually hand-tied twice! We want you to be thrilled with your wedding garter – not just happy! They are timeless and will always remind you of the most special day of your life! Once we have finished sewing your beautiful Wedding Garter, we nestle it gently onto a white keepsake satin drawstring bag where you can keep it safely inside, dust free after your Wedding Day. A beautiful keepsake Wedding Garter deserves to be protected carefully for the future as well as for your Wedding Day. We then close your white gift box with a pink satin ribbon bow before wrapping it carefully in bubble-wrap to protect it whilst it is shipped and on its way to you. 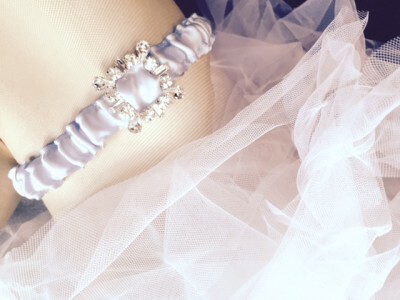 Once ordered, our team works hard to get your Bridal Garter to you as soon as we can. We will complete your garter within 7 business days of your order, but if you need it urgently – please ask us to PRIORITIZE the order for you. Normal shipping with Australia Post within Australia takes 2 – 7 working days to reach you, depending on where you live. Please allow at least two weeks from the date of your order to receive your Wedding Garter, more if you live in the Country and outer areas. Be the first to review “Retro Rhinestone Wedding Garter” Click here to cancel reply.